You should be able to customize and print all planners on this site free of charge. If you have encountered a difficulty then please check the following FAQ for a solution. If you don’t find a solution then please leave a comment on the page on which you have a problem and we will try to help. How to Print the Planner? How to Save the Planner? Why can’t I download as an image? I downloaded the file but I can’t find it. How do I print on one page? I have another problem that is preventing me from customizing, downloading or printing the planners. I found a mistake or typo. 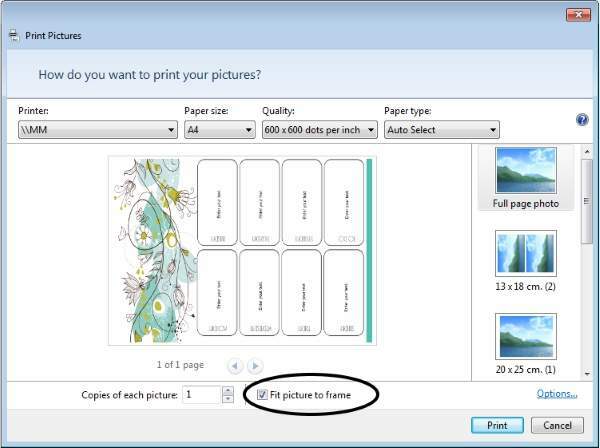 You can either print directly by clicking on the printer icon or save the planner on your PC and print from the file. When printing directly from the app, check the print preview before you print. 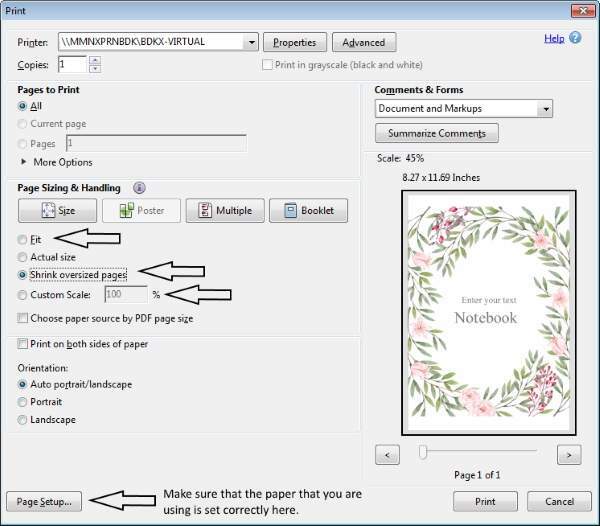 If the printable does not fit on the page then change the settings until it does fit (for example, click on “fit on page” if your browser has that option). Alternatively, just download the file and open it to print. If you cannot print directly (for example if you have a popup blocker installed on your PC) then just download the file and print from your PC. Most planners can be saved both as images (by clicking on the cloud icon) or as PDF files (by clicking on the page icon). Some of the planners can only be saved as a PDF file. In some cases, you cannot download as an image. This happens when the file is relatively “heavy” (more than 1.2MB). If you try to download as an image and it doesn’t download then try and download as a PDF document. Once the file is downloaded it is saved in your “downloads” folder unless you have set your browser settings to save elsewhere. Some browsers will also ask you where you want to save (you can set yours to ask you each time you download something). Click on “fit picture to frame”. Don’t forget to select US letter or A4. Click on “fit” or “shrink oversized pages” or select “custom scale” and change the scale to fit the page. Don’t forget to select US letter or A4 under “page setup”. Please note that in order to enable you to print in high resolution our documents are very large. Some software causes the document to be printed on two pages. If this happens to you, we suggest that you use Adobe Reader (see next section) which can be downloaded free and prints the files on one page. To open a PDF file you will need a program which most probably is installed on your PC. This program will enable you to view PDF files from another site or source. If you don’t have a program then you can get one free. 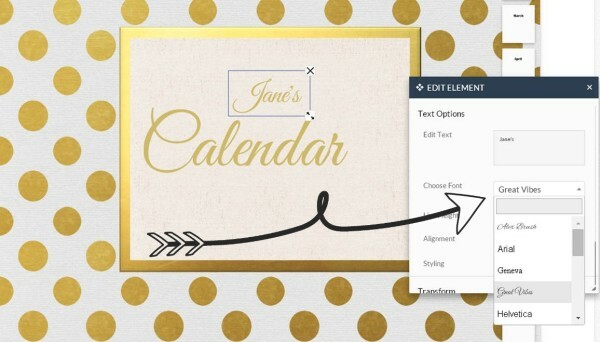 You can upload photos or icons to your planner. If your photo is not uploading it might be really big or really small. Please leave a comment with a link to the planner that you are trying to customize and we will get that fixed. You can also click on “Feedback and Suggestions” from the page with the problem. If you click on “Receive Updates” then we will let you know once the problem is fixed. Please click on “Feedback and Suggestion” preferable from the page with the problem and we will get that fixed. If you click on “Receive Updates” then we will let you know when it is fixed. You are free to use our printables for personal or commercial use BUT they cannot be presented on any website without linking back to this site. You are free to sell hard copies of printables created on this site but if you market them on any website you are required to link back to this site. Are all the calendars free? Yes, all of the calendars are free. How to Make Printable Calendars? Open the calendar maker and select a background, icon (optional) and monthly calendar. You can add your own text and photos as well. How do you make a calendar for a year? Create each month and download. Continue with the next month. Keep going until you make all the months that you want to include. Print them all. Each month can use the same design or you can use a new design for each month. The choice is yours. When I try to download the calendar as an image I get a network error. Most of the calendars can only be downloaded as a PDF document. If you try to download as an image (the cloud icon) but the calendar does not start to download or you receive an error message then download as a PDF document (the paper icon). How do I change the name on the cover of the printable calendar? When you open the calendar the name will be automatically marked. There are two ways to edit the text. Either put your mouse on the text and double click and then you can type your name or whatever text you want to appear. Enter the text in the little box under “edit text”. How do I add the year? Follow the instructions above to edit text. To add the year right after the month: After the month just type in the year. If you want the year to appear on the next line then just click on enter between the month and year to move the year to the next line. Click on “add text or image” on the top of the page. Click on “add your own text”. Type the year and move it to wherever you would like it to appear. You can also make it bigger or smaller if you want and change the font. How do I change the font of the text? 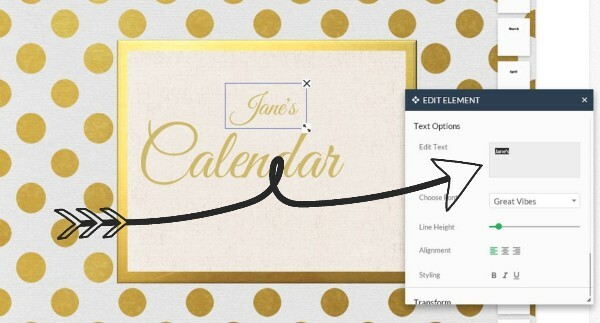 All of the text on the printable calendars can be edited. You can also change the font design and the font size. To change the font just click on “change font” and a list of fonts will appear. Choose the font that you want to use. How do I move text? Click on the text that you want to move and drag it around until you are happy with the location. How do I make text bigger or smaller? Click on the two arrows on the bottom right side of the text box and drag to the right (to make text bigger) or to the left (to make text smaller). How do I create a monthly calendar for a specific month? On the right side of the calendar, there is a list with each month of the year. Click on the month that you want to create and that calendar will appear. How to add text such as a birthday that I want to remember? Click on the text that appears to move it or make it smaller or larger. See instructions above on how to make changes to the text. How to add icons such as a birthday cake next to the date of a friend’s birthday? Click on “add an icon”. Choose the icon that you want to add. Click on the icon that appears to move it or make it smaller or larger. If you want to add text next to the icon then follow the instructions above. I downloaded the calendar as a PDF document but I cannot open it. If you do not have a program to open PDF documents you can get it free here. It is a useful program that you can use to read all PDF documents. If you download the calendar as a PDF document then it will create a 12 month calendar for the next 12 months. If you only want to print one month then just check which page that month appears on and print that month only.